He made the claim to the RHI inquiry on Thursday. The former enterprise minister is due to appear at the inquiry to give a second day of evidence later today. He added he could not operate against a Spad saying he would shape his story to the DUP narrative: "That is entirely fitting me up". 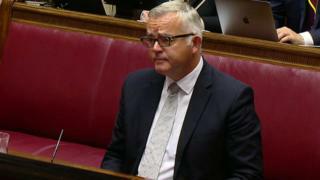 He claimed unelected special advisers had taken many decisions during devolution, and said he believed Timothy Cairns felt more responsible to the other special advisers in the DUP, Timothy Johnston and Richard Bullick, than to Mr Bell.